The RMI is a Remote Mobile Investigator that is used by Police, Fire Departments, Military, Nuclear and Industrial Institutions world wide. It is a lightweight, battery operated, multi-purpose vehicle that has proven to be ideal for the remote handling of Improvised Explosive Devices, Hazardous Chemicals, Radio Active Materials, Fire Fighting, Hostage Situations, Hijackings, and other Hazardous Situations. The RMI has been chosen by experienced technicians world wide due to it's dependability, simplicity, and ease of operation. The RMI-9XD is a versatile 6 wheeled vehicle with removable tracks for extra climbing capability. 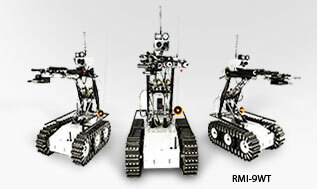 The RMI-9XD adds dual extending front arms, upgraded IP-67 plugs and sealed electronics, digital video transmission, and a total of 8 camera ports. Add a tilting disrupter mount, hitch kit and new claw tools, and the RMI-9XD will meet all your EOD needs. High lifting capacity manipulator with dual extension front arm. Right side of arm offers motorized arm extension 19” (48.26 cm) for claw. Left side of arm offers motorized arm extension 19” (48.26 cm) for disrupter. Tilting/panning dual recoilless disrupter mount with laser aiming, colour disrupter sighting camera with LED light and disrupter firing terminals. Disrupters stow neatly out of the way of the right extender arm allowing unobstructed use of claw. Using fixed arm extenders the robot can be configured for many different applications such as under car searches and 2nd story window access. Three different sized claws are available with cameras. ¼ -turn Mil-spec sealed connectors with IP67 rating. Modular design allows for easy service/repair. All electronic modules are water tight and each module is connected by plugs for simple removal. High capacity robot platform batteries (2 x 55 Ah batteries) for increased mission time. Front cover and electronic box secured by latching system for quick access without the use of tools. Latch type battery holder and plug in quick release battery terminals for quick battery change without the use of tools. 8 cameras with high power halogen or LED light source. Tilt or pan function of cameras proportionally controlled for precise movement. Updated control box to accommodate added features and more precise control. Precise movement of the RMI can be mastered with intuitive joystick control. Multiple functions can be performed simultaneously. Control console with 10.4” (26.4cm) daylight readable LCD in a rugged explorer case. Digital Transmitter system allows extended range, flicker free video reception, integrated two way audio and ability to record to USB flash drive. Quad view video system allows for display of 4 cameras at a time. 100 m (330’) control cable on continuous feed reel. Optional 200 m (660”) control cable. Two minute delay weapons safety circuit with 4 check lights enhances operator safety. Dual shock tube initiator hook-up. Gun camera with integrated aiming laser. Additional fuses for increased circuit protection. X-ray attachment for the XR150/XR200/XRS-3 X-ray unit and real-time X-ray systems. Power drill kit with remote on/off. Trailer hitch kit and remote release assembly.